I’ve got nowhere near 1000 followers on twitter (@timeblimp, hint hint), but I do have a few thousand tweets. For my next trick, I fed my entire twitter timeline history into the random text generator, to produce some new automatically-generated tweets that are in my style. “the chupacabra on fire tonight. madeupfacts cool use emitted by birds oh snap yo mamma about as skiiers”. “i cut that smelled up for societys universe is it into a quasar at a sentially sympathize”. As it turns out I wasn’t the first nerd to do this. There are several random-tweet-generators on the web that you can try out if you have a twitter account. I am the first, however, to do something much cooler. What, you ask? Well, howsabout mash up the U.S. Constitution, Declaration of Independence, and the works of Dolemite together, then send that through the random text generator! You don’t know Dolemite? He was the movie persona of comedian Rudy Ray Moore, part pimp, part proto-rapper, part blaxploitation-movie hero, part Avenging Disco Godfather. (Warning: the language gets pretty bad-#ss from here on out). Was the baddest muthaf*cka the world has ever seen. 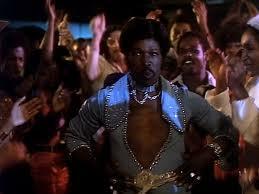 And let me tell ya about the little baaaaaad muthaf*cka called Dolemite. In other words, the perfect poet to mash together with America’s most important texts. I screwed my wig on tight and shuffled a few select rhymes from the Moore canon with our nation’s founding documents to produce what I call “The Declaration of Dolemite”. Check ‘em out, pimp! “and suffice is get if of a way, grass. but the laws our erectively. to the any but congress third ther the brotherein”. Erectively. That sums up the Declaration of Dolemite nicely. "Lotsa wigs in this continental congress, but not many b*tches"
Damn congressional zebras. Hopefully grandmaw gets ‘em. The Declaration of Dolemite may be crude, but clearly he speaks of enlightened, benevolent, almost pimp-like leadership of a new nation. I posted these to twitter a while back, baffling most of my followers but delighting a few. If you’re one of the few with your wig on tight enough to appreciate these, shoot me a note on twitter at @timeblimp, with any other random mash-ups you’d like to see.